The Atacama Desert in Chile is known for being home to several astronomical observatories. The region's high altitude and scarce rainfall provides crystal-clear skies for impeccable observing conditions. But this high desert also offers an unparalleled approximation of the conditions on Mars. With its harsh, dry environment and intense ultraviolet radiation, most life in this extreme desert exists as microbial colonies underground or inside rocks. That makes the Atacama Desert a good place to practice looking for life on Mars. NASA's Atacama Rover Astrobiology Drilling Studies (ARADS) team just concluded their second season in Chile, testing out their KREX-2 rover. 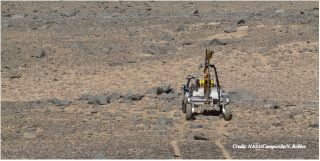 Thirty-five researchers, scientists, engineers, and support staff spent a month testing out this prototype rover, sending it on various mission to use its drill and life-detection instruments. Using the unforgiving landscape, they were able to demonstrate the technical feasibility and scientific value of a mission that searches for evidence of life on Mars. "Putting life-detection instruments in a difficult, Mars-analog environment will help us figure out the best ways of looking for past or current life on Mars, if it existed," said Dr. Brian Glass, a scientist at the NASA Ames Research Center and the principal investigator of ARADS. He also led the first expedition in 2016. "Having both subsurface reach and surface mobility should greatly increase the number of biomarker and life-target sites we can sample in the Atacama." The rover in its mobile configuration with drill raised and visible at the front, arm stowed, and instruments closed. Glass said the team tested out KREX-2's drill and robotic arm, as well test as assessing the driving capabilities of the rover. "It behaved beautifully in the field," he said. "It was a steady platform that enabled us to [drill] deeper than we expected." The KREX-2 rover carries a lightweight, low-power, two-meter drill, along with a robotic sample transfer arm. This year, the team tested out three life-detection instruments, positioned nearby, which were fed samples acquired by the rover's drill. The instruments included the Wet Chemistry Laboratory, an instrument developed by NASA's Jet Propulsion Laboratory that flew on the 2007 Phoenix mission to Mars, and the Signs of Life Detector, from Spain's Center for Astrobiology. This instrument uses biochemical tests to search for 512 different biological compounds. Members of the ARADS team – NASA's Atacama Rover Astrobiology Drilling Studies project – start the day setting up the rover for test runs in Chile's Atacama Desert. Another instrument making its first trial run is the Microfluidic Life Analyzer from JPL, which processes extremely small samples of any water found under or inside of rocks. It can isolate amino acids, a building block of life. Together, the three ARADS instruments searched for signs of current or past life. The scientific data collected provides insights on how life exists in the high desert today and how it first developed in this environment. Their geological and soil mineral tests also showed that extremely dry conditions have persisted in the Atacama Desert for at least 10 to 15 million years, and possibly far longer. The ARADS team's stated goal is to pave the way for future Mars rovers that can help answer some of humanity's fundamental questions about life beyond Earth, such as whether Mars was home to microbial life in the past, and if it still is today. These tests are helping plan for the instruments on NASA's Mars 2020 rover, which – among other experiments -- will search directly for the signatures of life, past or present, on Mars. This year's ARADS expedition was the second of four annual tests planned through early 2019. Next year, the team hopes to have the rover carry out and operate the life-detection instruments itself, along with the drill that was tested this year. WATCH: How Far Do Mars Rovers Travel Before They Die?